Even the IMF are jumping onto the idea that money is being debased by QE and that trade imbalances are causing massive valuation difficulties. I read this as an explicit criticism of central bankers, currency manipulation and trade and financing imbalances. And the FSA appear to be concerned that people are opting out of the traditional monetary system and following the IMF's advice by making negative statements about alternative stores of value. Arguments between different central banks and regulators are often a precursor to a full blown financial crisis. There is a storm brewing here. I am just not sure whether it is in a teacup or on a larger scale. Several metal traders and experts have written to the City watchdog claiming that licensing the so-called physically-backed exchange-traded funds (ETFs), which banks including JP Morgan, Goldman Sachs and Deutsche Bank have said they plan to launch shortly, may amount to "approving the next financial bubble". Traders' concerns are based on the ETFs model that will require the investments to be backed by physical metals, such as copper, lead, aluminium and nickel, rather than paper assets offered by futures contracts. They claim that the success of existing physical ETFs, particularly gold, will not translate to other metals. Metals experts warn that investors will face expensive shipping, storage and disposal costs that are likely to take the lion's share of the investment gains. They also claim ETFs could distort commodities markets around the world. One trader told The Daily Telegraph: "Metals like copper are in intense demand. By buying futures contracts, investors have never impacted the physical cost or supply of copper. But allowing investors to hoard physical supplies is the equivalent of allowing investors to sit on warehouses of wheat while Tesco is short of bread." It is estimated that if the planned copper funds are fully subscribed they would be looking to buy more than half the total stocks in LME warehouses. JP Morgan and Goldman Sachs refused to comment. A spokesman for Deutsche Bank said that the ETFs had "not yet been launched." Another source close to one of the banks said: "These fears are overblown. The metal markets have strict rules in place to prevent these sorts of manipulations." Soon to be followed by our old friend gold confiscation. It is their only way out it seems. As usual, our friend who is just as old will also make himself known : the black market in contraband goods trading at a massive premium to the legal market. "Zoellick really may be the stupidest man alive"
Bullion, of course. The Argentina experience was that ALL gold became valued as 9 carat (low grade jewelery) gold, which of course cannot be seized as there is no record of it. People started cutting up their necklaces to buy essentials, the markets (black) were "policed" by the mafia. it worked. I believe the Russians did something similar with Vodka, but it was difficult to assay the purity. "Paul Krugman wins Economics Nobel : Much deserved"
I think that should shatter a few, freemarket illusions. The existence of free markets is an illusion. So is the existence of money. We'll see a massive CGT-hike on gold first I think, plus perhaps the introduction of VAT too. Discouraging ownership through such measures is a bit less dramatic than confiscation and far less draconian (in appearance) and will probably work better than going round kicking people's doors down. After all, there's no room in the prisons, so as long as you can hide it well enough, gold owners don't have much to fear from confiscation. True. It is a temporary token that we use to exchange what participants in the exchange consider to be of value. The tokens that we use may well change. The rate of exchange between the tokens and the things of perceived value change very frequently. one wonders then how debasement might be defined in any rational sense? The ratio of the number of credits to the plausible authority of the man behind the curtain. Frogs notice if they are boiled quickly. Via the observed rate of exchange between the tokens and things of perceived value. Over time, we may accept different rates of exchange as being the "new normal" but during the times of adjustment, we certainly notice the debasement. but it works in both directions. items fluctuate up and down against tokens. why is debasement only one way? 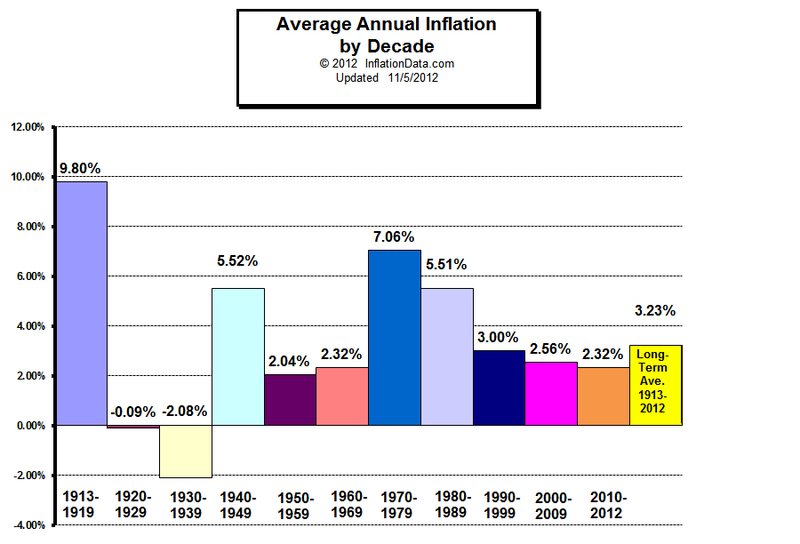 Inflation has been a more frequent occurence than deflation in the history of money. I am very open to the possibility that we might have a sustained period of deflation ahead despite the best and massive efforts of some central banks to the contrary. Can you convert your real and nominal rates to an inflation rate and add it to the graph? My visualisation skills are not that good. They'll print trillions every minute to prove you wrong! You mean forced?? Not going to happen. The confiscation started a couple of years ago...CASH FOR GOLD! Confiscation by stealth...the sheeple have no idea! Ron Paul and Ben Bernanke are going to have some huge fights in the next 6 months. It will be interesting to watch. I wonder if there is enough public support in the US to allow for a bill that prevents further QE. ...so we have an unanimous vote of no confidence. Any historians around here? I'd be on shaky ground if I tried to draw parallels to such events as the decline of the Roman empire with reference to the debasement of its coin.